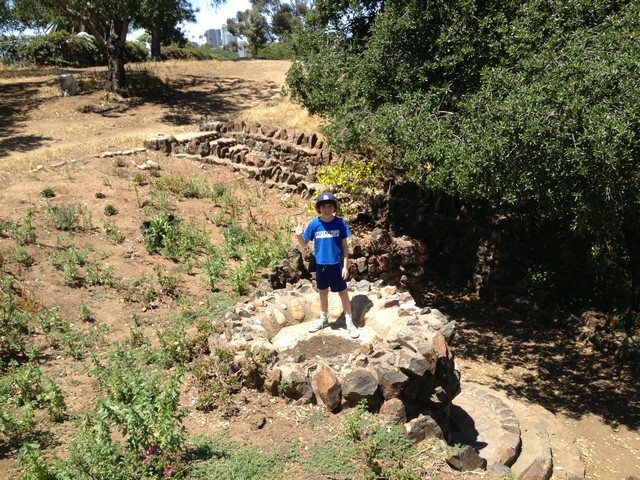 Walt also likes the surrounding Golden Hill Gateway Park because, “it’s where the wilderness meets the city. There are animals that live there and secret paths and canyons that make you forget where you are.” So off we went to investigate. On our way there, we took the side route and entered off 24th Street, following the trail of flowers and graffiti past the beautiful Golden Hill Community Garden that is so popular that it takes years to get to the top of the waiting list. Hence, we just peeked over the fence to see what was in the current crop. It was a lovely day, and we walked by golden poppies, purple verbena, and other things of beauty, saw tags for “Zen THC Zone” and “Jesus Saves,” and observed a fantastic totem scratched on a tree before making our way to the Fountain Grotto. Once there, Walt ran up and down the stairs and climbed on top of the fountain where he found that some hipster kids had scrawled, “MGMT are babes” next to less savory missives. Down in the center of the Grotto we found other tags by derelicts and gangsters along with some colorfully bizarre faces that struck me as the product of a stoner version of the cave painters at Lascaux. The Golden Hill Park section of Balboa Park was developed and largely financed by nearby residents before anything but chaparral was in the Park’s center. The National Register Golden Hill fountain is actually a rustic Arts & Crafts style inglenook with benches, rock double stairways, walls and radiating trails. The site was designed in 1907 by architect Henry Lord Gay, best known in town for designing the Western Metal Supply Company Building, now a part of Petco Park. Other than weed abatement and trash pickup, the area has been neglected by the City, its owner, for 50 or more years. The wood benches are long gone, the native stone and concrete stairs are decomposing and a safety hazard, and the fountain last worked in perhaps the 1930s. There is no identifying signage and the view from the road is blocked by random, rogue bushes. The City needs to start treating the Park’s east side with the same respect and care as the Prado area. This 102-year-old site can and should be brought back to the neighborhood amenity and tourist attraction that it was in the pre-Expo days. As Walter and I peered over the side of the Grotto at the carpet of orange nasturtiums that sloped down the canyon towards the trail snaking below it, I asked him if he’d like to see them fix it up, to which he said, “Yeah, they should fix it up, just like it used to be and put back the wooden benches. And it would be good to get water back into the fountain. It would be something special for the neighborhood.” I couldn’t agree more. Though we like to walk among the ruins and have adventures on the canyon trails, returning the fountain to its turn of the century grandeur would be the kind of urban renewal I can get behind: quality public space with public history, free to all. 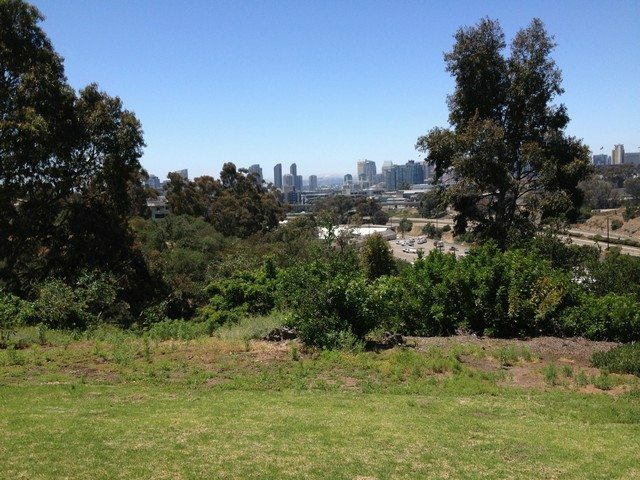 After our adventure at the fountain and down the trail, we walked around the magnificent loop with views of downtown and Point Loma in the distance. There were families having picnics and kids playing soccer in the open middle section of the park. Off to the sides lovers made out discreetly on secluded benches and homeless people slept peacefully in the shade underneath the big old palm trees. That day we saw a hawk, squirrels, and the carcass of something that must have been dinner for a coyote. Surely there were also raccoons and possums hiding somewhere in our little pocket of wilderness on the edge of Golden Hill. Great post, great park. Have enjoyed many strolls on the road there. Good piece. Susan Bugbee a long time resident of South Park did a lot of research on the fountain several years ago and has the complete story–really interesting. Awesome place! I still can’t figure out where it is. Maybe a map – anybody got a map? Frank – here’s a Google Map I saved. The two blue placemarks on the south-west portion of the park, near the 25th Street park entrance mark the location of the fountain. Well worth a visit in person if you’re in the area, you can see some of the old pathways lined with stones, etc. 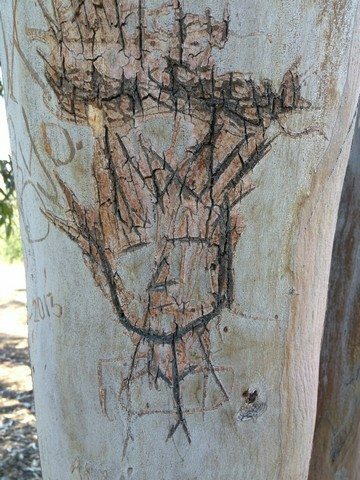 great article John, I live in the area and think this is an amazing artifact. Is there a link to the Susan Bugbee article Richard mentioned ?